Mike Jones sat in the back parking lot of DeMatha Catholic High and counted the students trickling out of the building wearing the NBA’s latest fashion trend. LeBron James has taken to rocking the look. So has Russell Westbrook. And Stephen Curry. And Kevin Durant. And Chris Paul. It’s part of high fashion now, drawing the attention of Instagram models and celebrities out on the town. And the all-boys school in Hyattsville, Md., is happy to take at least partial credit for its origin. DeMatha has a strict dress code during colder months: shirt, tie, dress slacks, dress shoes and a crimson blazer on top. When it’s chilly, students are supposed to put on a formal sweater over their shirt and tie, but quite a few opt for a hoodie instead, letting the hood flap against the collar of their sport coats. The school also has a legendary basketball program, which has finished nationally ranked 20 times and sent 18 players to the NBA. Among them is the Indiana Pacers’ Victor Oladipo, one of the league’s ascendant stars and fashion icons. 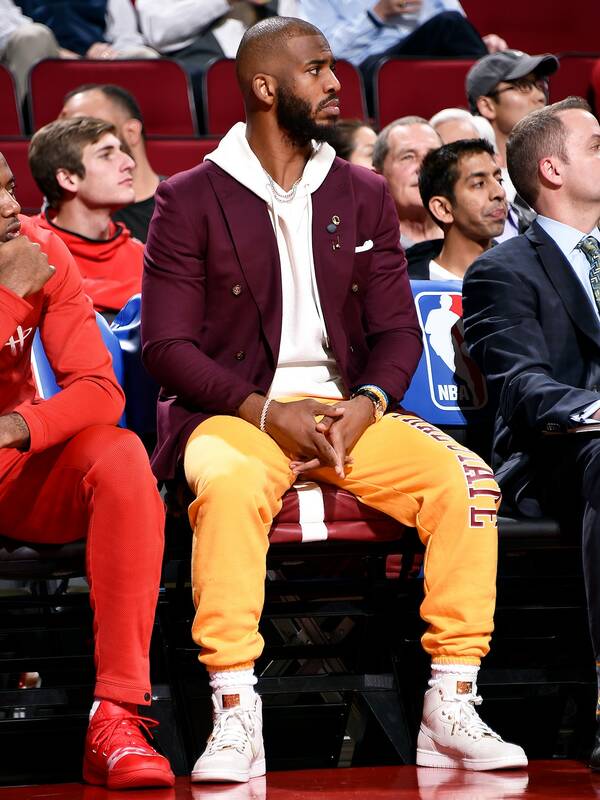 DeMatha boosters theorize that as alumni reached the NBA and tried to comply with the league’s dress code, they brought the hoodie and blazer look along, helping popularize it among other players. According to Grant, the look was born out of necessity. Most DeMatha students leave their sport coats in their lockers overnight, and on cold days they arrive to school wearing a hoodie. On the way to class, they throw the blazer on top of the whole get-up. Students so attired ducked teachers in the hallways because hoodies are technically a uniform infraction. But a number of faculty members, Grant said, recognized the growing fashion trend and let the violation slide, provided the hoodie hadn’t come directly from the gym. That doesn’t mean DeMatha created the hoodie-and-blazer phenomenon. More likely, its NBA stars helped popularize the look to an influential audience, although fashion designers have played with the core tenets of the combination for years, The Washington Post fashion critic Robin Givhan noted. Designers love the idea of the “commuter as nomad,” she wrote. Guys often don’t have the time or space to pack a separate outfit for the gym, so they throw on their blazers over their hoodies. Brands like Public School NYC and Rag & Bone have played on this aesthetic with similar looks. DeMatha students hit on a key component of modern street style, said Ryen Anderson, a style expert at retailer Stitch Fix. Or, for NBA players, it’s perfect for sitting on the bench in comfort and style during an off night or making a fashion statement while talking to reporters after a game. Grant said he notices each time a new player around the league tries it out, but he doesn’t bother telling teammates they owe his high school a debt of thanks.